Wonderful pre-Rennell map of India. Presqu'Isle des Indes Orientales, Comprenant l'Indostan ou Empire du Mogol, Differens Royaumes ou Etats, Les Vastes Possessions des Anglais, et les autres Etablissemens EuropEens, avec les Grandes Routes. 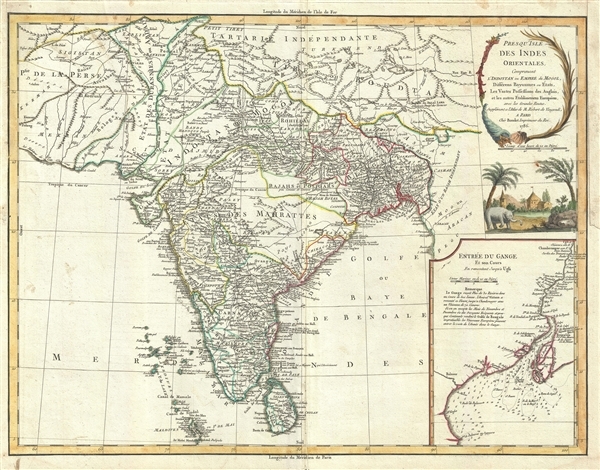 This is a scarce and beautiful 1786 map of India and Sri Lanka by Robert de Vaugondy. It covers the Indian subcontinent from Independent Tartary south to include Ceylon and the Maldives and from Persia east as far as Aracan in the east. It offers extraordinary detail throughout, with numerous notations on matters geographical, historical, and cultural. Shows roads, cities, mountain ranges, lakes and rivers with territories depicted by outline color. This map offers a smorgasbord of information for the historian interested political changes in India during the 18th century. Identifies Delhi (or Jehan Abad), Agra (or Ekbar Abad), Bombay, Goa, Calcutta, Pondicherry, and countless other major and minor cities. An inset in the lower right quadrant focuses on the mouths and the course of the River Ganga or Ganges from Hooghly, south part Calcutta into the Bay of Bengal. Originally drawn in 1749, our map predates the definitive Alexander Dalrymple mapping of India in the 1770s and so is quite vague in a number of areas - especially those controlled the independent Maratha Confederacy southwest of Bihar. In this area there are several speculative rivers as well as large lake, labeled Chilea or Ganga. This is most likely an erroneous mapping of Chilka Lake (Chilika Lake). Chilka Lake is the second largest salt water lagoon in the world - but was clearly missed by early mapmakers working on the Orissa coast. In Assam, Vaugondy maps the 'supposed' locations of the apocryphal Lake of Chiamay. Early cartographers speculated that such a lake must exist as the source of four important Southeast Asian river systems including the Irrawaddy, the Dharla, the Chao Phraya, and the Brahmaputra. This lake began to appear in maps of this region as early as the 16th century and persisted well into the late 18th century. Its origins are unknown but may originate in a lost 16th century geography prepared by the Portuguese scholar Jao de Barros. It was also heavily discussed in the journals of Sven Hedin, who believed it to be associated with Indian mythology that a sacred lake linked several holy river systems. There are even records that the King of Siam led an invasionary force to take control of the lake in the 16th century. Nonetheless, the theory of Lake Chimmay was ultimately disproved and it disappeared from maps entirely by the 1780s. On the far east of the map, Vaugondy identifies the Kingdom of Arakan, which flourished in the 16th and 17th centuries. The city of Mrauk-U, marked here as Aracan, was once described by Portuguese merchants as one of the most beautiful locations on earth, is today a spectacular but derelict ruin. An elaborate title cartouche depicting an elephant and a village appears in the top right quadrant of the map. This map was drawn by Robert de Vaugondy and published in the 1757 issue of his Atlas Universal. All in all a spectacular map with much to offer and a welcome addition to any serious collection focusing on the subcontinent. Very good. Light spotting at margins. Original platemark visible. Minor centerfold reinforcement at margins. Pedley, Mary Sponberg Belle et Utile: The Work of the Robert de Vaugondy Family of Mapmakers, 399.